Tarek Chemaly: Ford Predictive knew exactly what would happen on the Le Mans race - as if by magic! 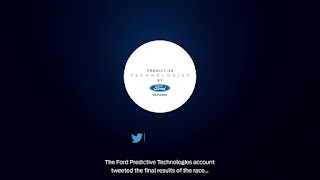 Ford Predictive knew exactly what would happen on the Le Mans race - as if by magic! Ford should enter Arabs Got Talent, or whatever nation got talent under "magic" category. The brand tweeting from @fordpretech account knew - almost second by second what would happen in the most unpredictable of races (Le Mans) up to the winning trio! Well, as with everything "magical" it was actually an illusion. What for did is that it put all possible combination of events, 10,000 of them, on a private account. Save the tweets on a private account, deleted all the combinations which did not happen. Then retweeted everything from the official account claiming that Ford Predictive saw it coming a week prior to the events happening on Le Mans! See? Magic - and some calculus, analytics, statistics and probability all tossed in!